Modern electric bikes tend to be fairly simple, besides the motor and electronics, everything else is standard bike kit. 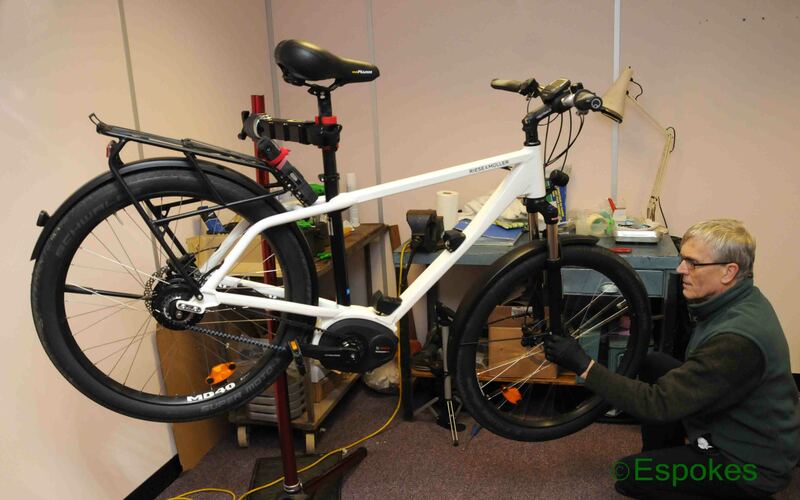 Our onsite workshop has everything we need to put your ebike together on arrival, pass it through a pre delivery inspection prior to you having the bike then keep it up and running throughout its life. We are the only Bosch eBike accredited dealer in Basingstoke and Howard is Cytech technical e-bike qualified. Having all had training from Bosch, TranzX and Shimano Steps on their systems we are kept up to date with all the latest technologies. It is mandatory all bikes are booked in advance so we can schedule our workload. Please clean your bike before bringing it into us. We will charge a valet fee if we have to clean it. We offer a FREE six week service on all ebikes purchased from us. Had the pleasure to meet these awesome people when my roodog became sick .repaired in a week now goes like new. highly recommended, nothing was to much trouble. Great shop with awesome folk. Ebikes are revolutionary cycles that should be looked after. You have invested your money in a good piece of kit that deserves to be well maintained. We urge you as a minimum, to clean and dry off your bike, lube the transmission and look after the battery.